Discussion in 'World Cup' started by TheSaxlad, Sep 5, 2017. GG's and best of luck for the rest of the tournament! Chaivon, Platypus, ApplePie and 1 other person like this. luca and i decided to play on thursday, he didn't respond to my request early thursday about setting a time, and i had to get off at about 1pm EST to go to sleep when he still hadnt replied. we rescheduled for sunday at 11pm GMT +2 and he hasn't shown up. i've waited for him to reply to a twitter dm (where we've been actively communicating) for 35 minutes since his suggested time (my latest message was sent at 5:09pm) and i have things to do tonight, so i'm requesting an activity win on the grounds that he was less proactive than me scheduling the game (took 2 days to reply to my request for times that he'd be available) and missed the scheduled time that he suggested. 1. If I ask you if its okay to play at 11pm I expect you to answer if you're okay with it BEFORE the sheduled time. Unless both people agree there isnt anything like a "sheduled time" , how could I know if you're okay with that time? 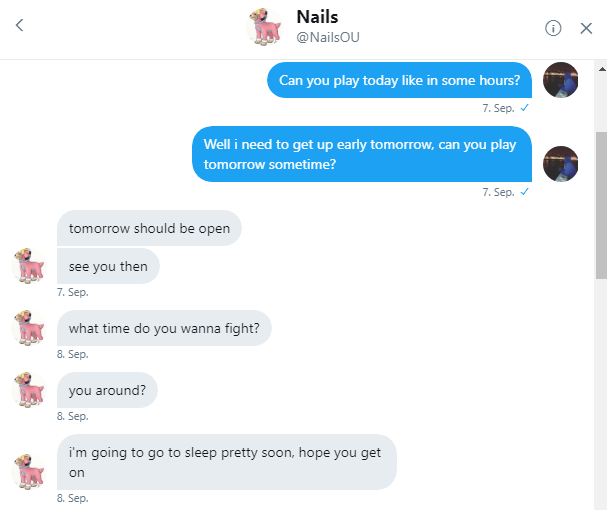 2. https://i.gyazo.com/17900a6dafd4802c82a2df74b659bddf.png We sheduled to play on Friday, I dont know where Nails is exactly living but with timezones being apart ~6-9 hours or something and me being not home until evening in my timezone I opened my twitter to see him saying that he is going to bed at 1pm in his timezone lol, this is actually not what I understand in "tomorrow is open"
fxelxy and Lega like this. I won 2-0 against MitchVGC for LATAM Andes.